Whether you're seeking a bachelor's, master's or doctorate degree, or post-graduate certificate, Saint Francis Medical Center College of Nursing can help you reach your goals. Already have a diploma or associate degree? Get your bachelor's degree in just 14 months through our accelerated program! You can receive credit for your past education and work history. Looking to build on your bachelor's degree? Our BSN to DNP program uses a distance learning approach to get you where you want to go – from wherever you are. At OSF Saint Francis Medical Center College of Nursing, we have 17 flexible, affordable graduate programs. We offer bachelor's, master's or doctorate degree, or post-graduate certificate in multiple clinical interests and specialties. Find the one that’s right for you. The Master of Science in Nursing program has an accelerated option for registered nurses who hold either an associate nursing degree or a diploma in nursing, have considerable nursing experience, outstanding academic histories and have a bachelor's degree in a discipline other than nursing from an accredited college or university. Upon completion of the five transition courses, the student will begin the MSN curriculum of choice. Adult Gerontology Acute Care Nurse Practitioners (AG ACNP) assess, diagnose and manage acutely ill patients in hospitals and hospital-to-clinic settings. They work in emergency departments, intensive care units, intermediate care units and specialty clinics such as cardiology or neurology. Adult-Gerontology Acute Care Nurse Practitioners focus on populations needing critical care and treatment of acute and chronic illnesses, disability and injury. The Family Nurse Practitioner (FNP) curriculum focuses on giving comprehensive wellness and illness care to individuals of all ages. The FNP provides disease management, health promotion and health education. Graduates will be prepared to assume leadership roles for the targeted populations in primary care settings. The FNP manages and treats individuals with acute and chronic illnesses in settings such as clinics, outpatient offices and more. 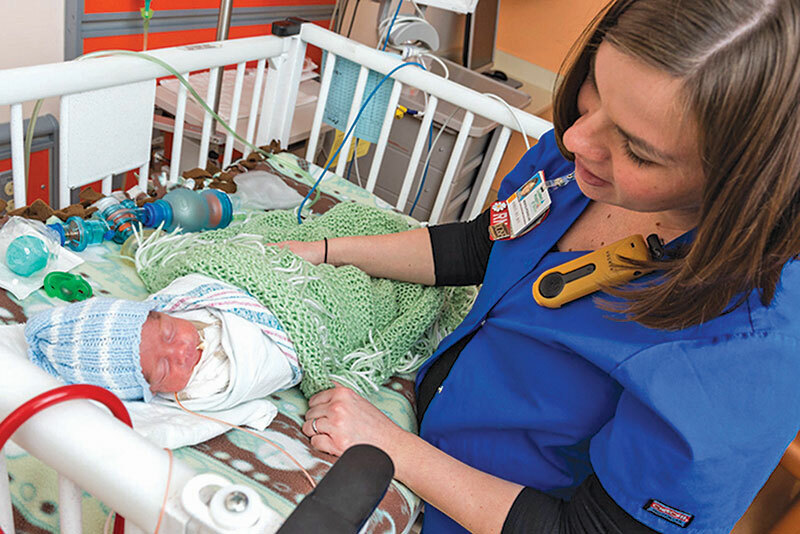 The Neonatal Nurse Practitioner (NNP) curriculum focuses on advanced care of newborns with a variety of conditions requiring treatment in the Neonatal Intensive Care Unit (NICU). 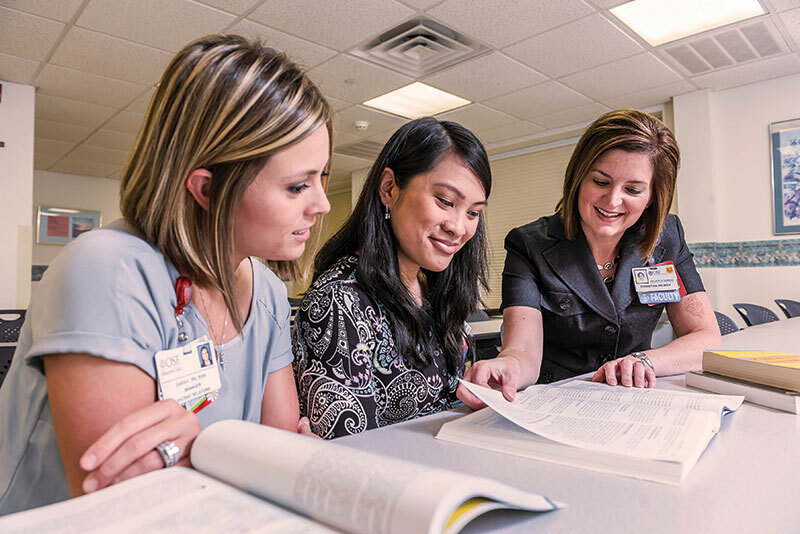 The Nurse Educator program will prepare students to use multiple educational delivery systems and to develop, implement and evaluate curriculum for nursing students or nurses in health care systems. This program is designed to enable the graduate to envision a broadened career perspective, and encourages focused research and development efforts. This option provides practicum experiences that emphasize depth and breadth in applying new knowledge as a health care leader. Upon completion of this degree, the graduate may qualify for the Advanced Nurse Executive certification exam. Graduates of the Doctor of Nursing Practice Clinical (DNP-C) program will use the latest scientific evidence to improve patient outcomes such as increasing patient safety, expediting patient healing, reducing health disparities and advancing quality of care. DNP-Cs use advanced critical thinking skills, innovation and well developed interdisciplinary leadership abilities to influence health care policy locally, regionally, nationally and globally for improved health for specific patient populations and entire communities. Upon graduation, graduates may take leadership roles in a clinical practice, apply their newfound skills in administration or combine their clinical knowledge and expertise with teaching. Graduates of the Doctor of Nursing Practice – Leadership (DNP-L) program will use the latest scientific evidence to transform systems of care. DNP-L graduates employ organizational, economic and leadership skills to design and implement programs or care delivery models that significantly improve health care outcomes and reduce health disparities. Graduates with this degree are prepared with advanced critical thinking skills for leading systems-focused changes in health care locally, regionally, nationally and globally. The Psychiatric Mental Health Nurse Practitioner (PMNNP) option focuses on social and psychological development of individuals and families. Graduates use advanced assessment, diagnostic techniques, pharmacological management and therapies for a wide range of patients from children to older adults. Graduates of the PMHNP option will demonstrate the ability to work in a variety of settings including mental health clinics, community-based mental health facilities, service centers, ambulatory care settings, private group practices, hospitals/medical centers, and emergency and urgent mental health care areas. We teach students from near and far with distance learning, traditional on-campus classes and hybrid programs. With online classes and flexible schedules, our programs are designed for nurses working full or part time! We’re affordable. Not only do we offer competitive tuition rates, we can connect you with resources to help you make your goals a reality. OSF HealthCare knows your education is important to you, and it’s important to us. Nurses who work at an OSF HealthCare facility receive a special tuition rate! Mission Partners also qualify for tuition assistance. Check your benefits package to understand how OSF HealthCare makes continuing your education more affordable. Deduct your payments directly from your paycheck. Interested in visiting our campus? Ready to take the next step in your nursing career? Saint Francis Medical Center College of Nursing is currently accepting applications. Learn more about opportunities, financial aid and how to apply today.